ERDDAP is a web application and a web service that aggregates scientific data from diverse local and remote sources and offers a simple, consistent way to download subsets of the data in common file formats and make graphs and maps. This web page discusses issues related to heavy ERDDAP usage loads and explores possibilities for dealing with extremely heavy loads via grids, clusters, federations, and cloud computing. The original version was written in June 2009. There have been no significant changes. This was last updated 2019-04-15. The contents of this web page are my (Bob Simons) personal opinions and do not necessarily reflect any position of the Government or the National Oceanic and Atmospheric Administration. The calculations are simplistic, but I think the conclusions are correct. Did I use faulty logic or make a mistake in my calculations? If so, the fault is mine alone. Please send an email with the correction to bob dot simons at noaa dot gov. A remote data source's bandwidth — Even with an efficient connection (e.g., via OPeNDAP), unless a remote data source has a very high bandwidth Internet connection, ERDDAP's responses will be constrained by how fast ERDDAP can get data from the data source. A solution is to copy the dataset onto ERDDAP's hard drive, perhaps with EDDGridCopy or EDDTableCopy. ERDDAP's server's bandwidth — Unless ERDDAP's server has a very high bandwidth Internet connection, ERDDAP's responses will be constrained by how fast ERDDAP can get data from the data sources and how fast ERDDAP can return data to the clients. The only solution is to get a faster Internet connection. Memory — If there are many simultaneous requests, ERDDAP can run out of memory and temporarily refuse new requests. (ERDDAP has a couple of mechanisms to avoid this and to minimize the consequences if it does happen.) So the more memory in the server the better. On a 32-bit server, 4+ GB is really good, 2 GB is okay, less is not recommended. On a 64-bit server, you can almost entirely avoid the problem but getting lots of memory. See the -Xmx and -Xms settings for ERDDAP/Tomcat. An ERDDAP getting heavy usage on a computer with a 64-bit server with 8GB of memory and -Xmx set to 4000M is rarely, if ever, constrained by memory. Hard drive bandwidth — Accessing data stored on the server's hard drive is vastly faster than accessing remote data. Even so, if the ERDDAP server has a very high bandwidth Internet connection, it is possible that accessing data on the hard drive will be a bottleneck. A partial solution is to use faster (e.g., 10,000 RPM) magnetic hard drives or SSD drives (if it makes sense cost-wise). Another solution is to store different datasets on different drives, so that the cumulative hard drive bandwidth is much higher. Too many files in a cache directory — ERDDAP caches all images, but only caches the data for certain types of data requests. It is possible for the cache directory for a dataset to have a large number of files temporarily. This will slow down requests to see if a file is in the cache (really!). <cacheMinutes> in setup.xml lets you set how long a file can be in the cache before it is deleted. Setting a smaller number would minimize this problem. NetCDF 4 and HDF 5 now support internal compression of data. Decompressing a large compressed NetCDF 4 / HDF 5 data file can take 10 or more seconds. (That's not an implementation fault. It's the nature of compression.) So, multiple simultaneous requests to datasets with data stored in compressed files can put a severe strain on any server. If this is a problem, the solution is to store popular datasets in uncompressed files, or get a server with a CPU with more cores. Making graphs (including maps): roughly 0.2 - 1 second per graph. So if there were many simultaneous unique requests for graphs (WMS clients often make 6 simultaneous requests! ), there could be a CPU limitation. When multiple users are running WMS clients, this becomes a problem. Under very heavy use, a single standalone ERDDAP will run into one or more of the constraints listed above and even the suggested solutions will be insufficient. For such situations, ERDDAP has features that make it easy to construct scalable grids (also called clusters or federations) of ERDDAPs which allow the system to handle very heavy use (e.g., for a large data center). I'm using grid as a general term to indicate a type of computer cluster where all of the parts may or may not be physically located in one facility and may or may not be centrally administered. An advantage of co-located, centrally owned and administered grids (clusters) is that they benefit from economies of scale (especially the human workload) and simplify making the parts of the system work well together. An advantage of non-co-located grids, non-centrally owned and administered (federations) is that they distribute the human workload and the cost, and may provide some additional fault tolerance. The solution I propose below works well for all grid topographies. The basic idea of designing a scalable system is to identify the potential bottlenecks and then design the system so that parts of the system can be replicated as needed to alleviate the bottlenecks. Ideally, each replicated part increases the capacity of that part of the system linearly (efficiency of scaling). The system isn't scalable unless there is a scalable solution for every bottleneck. Scalability is different from efficiency (how quickly a task can be done — efficiency of the parts). Scalability allows the system to grow to handle any level of demand. Efficiency (of scaling and of the parts) determines how may servers, etc., will be needed to meet a given level of demand. Efficiency is very important, but always has limits. Scalability is the only practical solution to building a system that can handle very heavy use. Ideally, the system will be scalable and efficient. To balance the capabilities of the parts of the system so that one part of the system won't overwhelm another part. To make a simple architecture so that the system is easy to set up and administer. To make an architecture that works well with all grid topographies. (If possible) To make an architecture that isn't tied any specific cloud computing service or other external services (because it doesn't need them). Basically, I suggest setting up a Composite ERDDAP (D in the diagram), which is a regular ERDDAP except that it just serves data from other ERDDAPs. The grid's architecture is designed to shift as much work as possible (CPU usage, memory usage, bandwidth usage) from the Composite ERDDAP to the other ERDDAPs. The composite ERDDAP has to send the data request to the other ERDDAP. The other ERDDAP has to get the data, reformat it, and transmit the data to the composite ERDDAP. The composite ERDDAP has to receive the data (using extra bandwidth), reformat it (using extra CPU time and memory), and transmit the data to the user (using extra bandwidth). By redirecting the data request and allowing the other ERDDAP to send the response directly to the user, the composite ERDDAP spends essentially no CPU time, memory, or bandwidth on data requests. The redirect is transparent to the user regardless of the client software (a browser or any other software or command line tool). A) For every remote data source that has a high-bandwidth OPeNDAP server, you can connect directly to the remote server. If the remote server is an ERDDAP, use EDDGridFromErddap or EDDTableFromERDDAP to serve the data in the Composite ERDDAP. If the remote server is some other type of DAP server, e.g., THREDDS, Hyrax, or GrADS, use EDDGridFromDap. B) For every ERDDAP-able data source (a data source from which ERDDAP can read data) that has a high-bandwidth server, set up another ERDDAP in the grid which is responsible for serving the data from this data source. If several such ERDDAPs aren't getting many requests for data, you can consolidate them into one ERDDAP. If the ERDDAP dedicated to getting data from one remote source is getting too many requests, there is a temptation to add additional ERDDAPs to access the remote data source. In special cases this may make sense, but it is more likely that this will overwhelm the remote data source (which is self-defeating) and also prevent other users from accessing the remote data source (which isn't nice). In such a case, consider setting up another ERDDAP to serve that one dataset and copy the dataset on that ERDDAP's hard drive (see C), perhaps with EDDGridCopy and/or EDDTableCopy. B servers must be publicly accessible. C) For every ERDDAP-able data source that has a low-bandwidth server (or is a slow service for other reasons), consider setting up another ERDDAP and storing a copy of the dataset on that ERDDAP's hard drives, perhaps with EDDGridCopy and/or EDDTableCopy. If several such ERDDAPs aren't getting many requests for data, you can consolidate them into one ERDDAP. C servers must be publicly accessible. D) The composite ERDDAP is a regular ERDDAP except that it just serves data from other ERDDAPs. Because the composite ERDDAP has information in memory about all of the datasets, it can quickly respond to requests for lists of datasets (full text searches, category searches, the list of all datasets), and requests for an individual dataset's Data Access Form, Make A Graph form, or WMS info page. These are all small, dynamically generated, HTML pages based on information which is held in memory. So the responses are very fast. Because requests for actual data are quickly redirected to the other ERDDAPs, the composite ERDDAP can quickly respond to requests for actual data without using any CPU time, memory, or bandwidth. By shifting as much work as possible (CPU, memory, bandwidth) from the Composite ERDDAP to the other ERDDAPs, the composite ERDDAP can appear to serve data from all of the datasets and yet still keep up with very large numbers of data requests from a large number of users. Preliminary tests indicate that the composite ERDDAP can respond to most requests in ~1ms of CPU time, or 1000 requests/second. So an 8 core processor should be able to respond to about 8000 requests/second. Although it is possible to envision bursts of higher activity which would cause slowdowns, that is a lot of throughput. It is likely that data center bandwidth will be the bottleneck long before the composite ERDDAP becomes the bottleneck. The EDDGrid/TableFromErddap in the composite ERDDAP only changes its stored information about each source dataset when the source dataset is "reload"ed and some piece of metadata changes (e.g., the time variable's actual_range), thereby generating a subscription notification. If the source dataset has data that changes frequently (for example, new data every second) and uses the "update" system to notice frequent changes to the underlying data, the EDDGrid/TableFromErddap won't be notified about these frequent changes until the next dataset "reload", so the EDDGrid/TableFromErddap won't be perfectly up-to-date. You can minimize this problem by changing the source dataset's <reloadEveryNMinutes> to a smaller value (60? 15?) so that there are more subscription notifications to tell the EDDGrid/TableFromErddap to update its information about the source dataset. Don't use <updateEveryNMillis> to keep the source dataset up-to-date. Set the source dataset's <reloadEveryNMinutes> to a larger number (1440?). Have the script contact the source dataset's flag URL right after it copies a new data file into place. That will lead to the source dataset being perfectly up-to-date and cause it to generate a subscription notification, which will be sent to the EDDGrid/TableFromErddap dataset. That will lead the EDDGrid/TableFromErddap dataset to be perfectly up-to-date (well, within 5 seconds of new data being added). And all that will be done efficiently (without unnecessary dataset reloads). In very extreme cases, or for fault tolerance, you may want to set up more than one composite ERDDAP. It is likely that other parts of the system (notably, the data center's bandwidth) will become a problem long before the composite ERDDAP becomes a bottleneck. So the solution is probably to set up additional, geographically diverse, data centers (mirrors), each with one composite ERDDAP and servers with ERDDAPs and (at least) mirror copies of the datasets which are in high demand. Such a setup also provides fault tolerance and data backup (via copying). In this case, it is best if the composite ERDDAPs have different URLs. When an underlying dataset is reloaded and the metadata changes (e.g., a new data file in a gridded dataset causes the time variable's actual_range to change), the composite ERDDAPs will be temporarily slightly out of synch, but with eventual consistency . Normally, they will re-synch within 5 seconds, but sometimes it will be longer. If a user makes an automated system that relies on ERDDAP subscriptions that trigger actions, the brief synchronicity problems will become significant. The 2+ composite ERDDAPs each maintain their own set of subscriptions (because of the synch problem described above). So a given user should be directed to just one of the composite ERDDAPs to avoid these problems. If one of the composite ERDDAPs goes down, the front end system can redirect that ERDDAP's users to another ERDDAP that is up. However, if it is a capacity problem that cause the first composite ERDDAP to fail (an overzealous user? a denial-of-service attack ? ), this makes it very likely that redirecting its users to other composite ERDDAPs will cause a cascading failure . Thus, the most robust setup is to have composite ERDDAPs with different URLs. Datasets In Very High Demand — In the really unusual case that one of the A, B, or C ERDDAPs can't keep up with the requests because of bandwidth or hard drive limitations, it makes sense to copy the data (again) on to another server+hardDrive+ERDDAP, perhaps with EDDGridCopy and/or EDDTableCopy. While it may seem ideal to have the original dataset and the copied dataset appear seamlessly as one dataset in the composite ERDDAP, this is difficult because the two datasets will be in slightly different states at different times (notably, after the original gets new data, but before the copied dataset gets its copy). Therefore, I recommend that the datasets be given slightly different titles (e.g., "... (copy #1)" and "... (copy #2)", or perhaps "(mirror #n)" or "(server #n)") and appear as separate datasets in the composite ERDDAP. Users are used to seeing lists of mirror sites at popular file download sites, so this shouldn't surprise or disappoint them. Because of bandwidth limitations at a given site, it may make sense to have the mirror located at another site. If the mirror copy is at a different data center, accessed just by that data center's composite ERDDAP, the different titles (e.g., "mirror #1) aren't necessary. RAIDs versus Regular Hard Drives — If a large dataset or a group of datasets are not heavily used, it may make sense to store the data on a RAID since it offers fault tolerance and since you don't need the processing power or bandwidth of another server. But if a dataset is heavily used, it may make more sense to copy the data on another server + ERDDAP + hard drive (similar to what Google does ) rather than to use one server and a RAID to store multiple datasets since you get to use both server+hardDrive+ERDDAPs in the grid until one of them fails. There is a burst of requests for one dataset (e.g., all students in a class simultaneously request similar data)? Only the ERDDAP serving that dataset will be overwhelmed and slow down or refuse requests. The composite ERDDAP and other ERDDAPs won't be affected. Since the limiting factor for a given dataset within the system is the hard drive with the data (not ERDDAP), the only solution (not immediate) is to make a copy of the dataset on a different server+hardDrive+ERDDAP. An A, B, or C ERDDAP fails (e.g., hard drive failure)? Only the dataset(s) served by that ERDDAP are affected. If the dataset(s) is mirrored on another server+hardDrive+ERDDAP, the effect is minimal. If the problem is a hard drive failure in a level 5 or 6 RAID, you just replace the drive and have the RAID rebuild the data on the drive. requests for data (which may be large) are redirected to the child ERDDAPs. Simple, Scalable — This system is easy to set up and administer, and easily extensible when any part of it becomes over-burdened. The only real limitations for a given data center are the data center's bandwidth and the cost of the system. Encourage clients to request subsets of the data if that is all that is needed. If the client only needs data for a small region or at a lower resolution, that is what they should request. Subsetting is a central focus of the protocols ERDDAP supports for requesting data. Encourage transmitting compressed data. ERDDAP compresses a data transmission if it finds "accept-encoding" in the HTTP GET request header. All web browsers use "accept-encoding" and automatically decompress the response. Other clients (e.g., computer programs) have to use it explicitly. Colocate your servers at an ISP or other site that offers relatively less expensive bandwidth costs. Disperse the servers with the ERDDAPs to different institutions so that the costs are dispersed. You can then link your composite ERDDAP to their ERDDAPs. Note that Cloud Computing and web hosting services offer all the Internet bandwidth you need, but don't solve the price problem. For general information on designing scalable, high capacity, fault-tolerant systems, see Michael T. Nygard's book Release It . Like Legos — Software designers often try to use good software design patterns to solve problems. Good patterns are good because they encapsulate good, easy to create and work with, general-purpose solutions that lead to systems with good properties. Pattern names are not standardized, so I'll call the pattern that ERDDAP uses the Lego Pattern. Each Lego (each ERDDAP) is a simple, small, standard, stand-alone, brick (data server) with a defined interface that allows it to be linked to other legos (ERDDAPs). The parts of ERDDAP that make up this system are: the subscription and flagURL systems (which allows for communication between ERDDAPs), the EDD...FromErddap redirect system, and the system of RESTful requests for data which can be generated by users or other ERDDAPs. Thus, given two or more legos (ERDDAPs), you can create a huge number of different shapes (network topologies of ERDDAPs). Sure, the design and features of ERDDAP could have been done differently, not Lego-like, perhaps just to enable and optimize for one specific topology. But we feel that ERDDAP's Lego-like design offers a good, general-purpose solution that enables any ERDDAP administrator (or group of administrators) to create all kinds of different federation topologies. 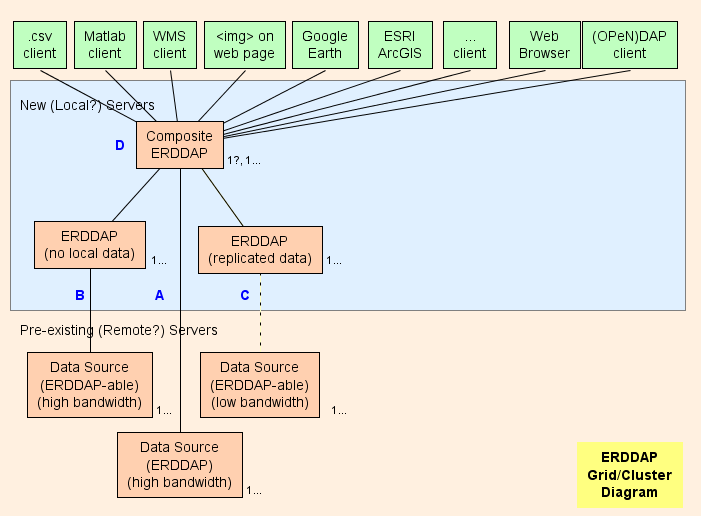 For example, a single organization could set up three (or more) ERDDAPs as shown in the ERDDAP Grid/Cluster Diagram above. Or a distributed group (IOOS? CoastWatch? NCEI? NWS? NOAA? USGS? DataONE? NEON? LTER? OOI? BODC? ONC? JRC? WMO?) can set up one ERDDAP in each small outpost (so the data can stay close to the source) and then set up a composite ERDDAP in the central office with virtual datasets (which are always perfectly up-to-date) from each of the small outpost ERDDAPs. Indeed, all of the ERDDAPs, installed at various institutions around the world, which get data from other ERDDAPs and/or provide data to other ERDDAPs, form a giant network of ERDDAPs. How cool is that?! So, as with Lego's, the possibilities are endless. That's why this is a good pattern. That's why this is a good design for ERDDAP. Different Types Of Requests — One of the real-life complications of this discussion of data server topologies is that there are different types of requests and different ways to optimize for the different types of requests. This is mostly a separate issue (How fast can the ERDDAP with the data respond to the request for data?) from the topology discussion (which deals with the relationships between data servers and which server has the actual data). ERDDAP, of course, tries to deal with all types of requests efficiently, but handles some better than others. For example: What is the metadata for this dataset? Or: What are the values of the time dimension for this gridded dataset? ERDDAP is designed to handle these as quickly as possible (usually in <=2 ms) by keeping this information in memory. Some requests are moderately hard. For example: Give me this subset of a dataset (which is in one data file). These requests can be handled relatively quickly because they aren't that difficult. Some requests are hard and thus are time consuming. For example: Give me this subset of a dataset (which might be in any of the 10,000+ data files, or might be from compressed data files that each take 10 seconds to decompress). ERDDAP v2.0 introduced some new, faster ways to deal with these requests, notably by allowing the request-handling thread to spawn several worker threads which tackle different subsets of the request. But there is another approach to this problem which ERDDAP does not yet support: subsets of the data files for a given dataset could be stored and analyzed on separate computers, and then the results combined on the original server. This approach is called MapReduce and is exemplified by Hadoop , the first (?) open-source MapReduce program, which was based on ideas from a Google paper. (If you need MapReduce in ERDDAP, please send an email request to bob.simons at noaa.gov.) Google's BigQuery is interesting because it seems to be an implementation of MapReduce applied to subsetting tabular datasets, which is one of ERDDAP's main goals. It is likely that you can create an ERDDAP dataset from a BigQuery dataset via EDDTableFromDatabase because BigQuery can be accessed via a JDBC interface. Yes, the calculations are simplistic (and now slightly dated), but I think the conclusions are correct. Did I use faulty logic or make a mistake in my calculations? If so, the fault is mine alone. Please send an email with the correction to bob dot simons at noaa dot gov. They offer access to very high bandwidth Internet connections. This alone may justify using these services. They only charge for the services you use. For example, you get access to a very high bandwidth Internet connection, but you only pay for actual data transferred. That lets you build a system that rarely gets overwhelmed (even at peak demand), without having to pay for capacity that is rarely used. They are easily extensible. You can change server types or add as many servers or as much storage as you want, in less than a minute. This alone may justify using these services. They free you from many of the administrative duties of running the servers and networks. This alone may justify using these services. They charge for their services, sometimes a lot (in absolute terms; not that it isn't a good value). The prices listed here are for Amazon EC2 . These prices (as of June 2015) will come down. In the past, prices were higher, but data files and the number of requests were smaller. In the future, prices will be lower, but data files and the number of requests will be larger. So the details change, but the situation stays relatively constant. And it isn't that the service is overpriced, it is that we are using and buying a lot of the service. Data Transfer — Data transfers into the system are now free (Yea!). Data transfers out of the system are $0.09/GB. One SATA hard drive (0.3GB/s) on one server with one ERDDAP can probably saturate a Gigabit Ethernet LAN (0.1GB/s). One Gigabit Ethernet LAN (0.1GB/s) can probably saturate an OC-12 Internet connection (0.06GB/s). The subsetting problem: The only way to efficiently distribute data from data files is to have the program which is distributing the data (e.g., ERDDAP) running on a server which has the data stored on a local hard drive (or similarly fast access to a SAN or local RAID). Local file systems allow ERDDAP (and underlying libraries, such as netcdf-java) to request specific byte ranges from the files and get responses very quickly. Many types of data requests from ERDDAP to the file (notably gridded data requests where the stride value is > 1) can't be done efficiently if the program has to request the entire file or big chunks of a file from a non-local (hence slower) data storage system and then extract a subset. If the cloud setup doesn't give ERDDAP fast access to byte ranges of the files (as fast as with local files), ERDDAP's access to the data will be a severe bottleneck and negate other benefits of using a cloud service. Now, a EDDGridFromFiles or EDDTableFromFiles dataset can be created from data files which are remote and accessible via the internet (e.g., AWS S3 buckets) by using the <cacheFromUrl> and <cacheSizeGB> options. ERDDAP will maintain a local cache of the most recently used data files. Now, if any EDDTableFromFiles source files are compressed (e.g., .tgz), ERDDAP will automatically decompress them when it reads them. Now, the ERDDAP thread responding to a given request will spawn worker threads to work on subsections of the request if you use the <nThreads> options. This parallelization should allow faster responses to difficult requests. These changes solve the problem of AWS S3 not offering local, block-level file storage and the (old) problem of access to S3 data having a significant lag. (Years ago (~2014), that lag was significant, but is now much shorter and so not as significant.) All in all, it means that setting up ERDDAP in the cloud works much better now. Thanks — Many thanks to Matthew Arrott and his group in the original OOI effort for their work on putting ERDDAP in the cloud and the resulting discussions. There is a common problem that is related to the above discussion of grids and federations of ERDDAPs: remote replication of datasets. The basic problem is: a data provider maintains a dataset that changes occasionally and a user wants to maintain an up-to-date local copy of this dataset (for any of a variety of reasons). Clearly, there are a huge number of variations of this. Some variations are much harder to deal with than others. It's harder to keep the local dataset up-to-date immediately (e.g., within 3 seconds) after every change to the source, rather than, for example, within a few hours. Frequent changes are harder to deal with than infrequent changes. For example, once-a-day changes are much easier to deal with than changes every 0.1 second. Small changes to a source file are harder to deal with than an entirely new file. This is especially true if the small changes may be anywhere in the file. Small changes are harder to detect and make it hard to isolate the data that needs to be replicated. New files are easy to detect and efficient to transfer. Keeping an entire dataset up-to-date is harder than maintaining just recent data. Some users just need recent data (e.g., the last 8 day's worth). Maintaining multiple remote copies at different sites is harder than maintaining one remote copy. This is the scaling problem. There are obviously a huge number of variations of possible types of changes to the source dataset and of the user's needs and expectations. Many of the variations are very difficult to solve. The best solution for one situation is often not the best solution for another situation — there isn't yet a universal great solution. offers a quick way to check if a dataset on a remote ERDDAP has changed. is a more efficient (than RSS) approach: it will immediately send an email or contact a URL to each subscriber whenever the dataset is updated and the update resulted in a change. It is efficient in that it happens ASAP and there is no wasted effort (as with polling an RSS service). Users can use other tools (like IFTTT ) to react to the email notifications from the subscription system. For example, a user could subscribe to a dataset on a remote ERDDAP and use IFTTT to react to the subscription email notifications and trigger updating the local dataset. provides a way for an ERDDAP administrator to tell a dataset on his/her ERDDAP to reload ASAP. The URL form of a flag can easily be used in scripts. The URL form of a flag can also be used as the action for a subscription. Custom solutions are a lot of work. Custom solutions are usually so customized to a given dataset and given user's system that they can't easily be reused. I discourage taking this approach because it is almost always better to look for general solutions, built and maintained by someone else, which can be easily reused in different situations. which then requests the chunks of files which have changed. Considering all that it does, rsync operates very quickly (e.g., 10 seconds plus data transfer time) and very efficiently. There are variations of rsync that optimize for different situations (e.g., by precalculating and caching the hashes of the chunks of each source file). The main weaknesses of rsync are: it takes some effort to set up (security issues); there are some scaling issues; and it isn't good for keeping NRT datasets really up-to-date (e.g., it's awkward to use rsync more than about every 5 minutes). If you can deal with the weaknesses, or if they don't affect your situation, rsync is an excellent, general purpose solution that anyone can use right now to solve many scenarios involving remote replication of datasets. There is an item on the ERDDAP To Do list to try to add support for rsync services to ERDDAP (probably a pretty difficult task), so that any client can use rsync (or a variant) to maintain an up-to-date copy of a dataset. If anyone wants to work on this, please email bob.simons at noaa.gov. There are other programs which do more or less what rsync does, sometimes oriented to dataset replication (although often at a file-copy level), e.g., Unidata's IDD . is available (starting with ERDDAP v2.0) for all of ERDDAP's dataset types that make datasets from files (basically, all subclasses of EDDGridFromFiles and EDDTableFromFiles). cacheFromUrl makes it trivial to automatically download and maintain the local data files by copying them from a remote source via the cacheFromUrl setting. The remote files can be in a Web Accessible Folder or a directory-like file list offered by THREDDS, Hyrax, an S3 bucket, or ERDDAP's "files" system. is a good solution when data is added to a dataset frequently, but older data is never changed. Basically, an ERDDAP administrator can run ArchiveADataset (perhaps in a script, perhaps run by cron) and specify a subset of a dataset that they want to extract (perhaps in multiple files) and package in a .zip or .tgz file, so that you can send the file to interested people or groups (e.g., NCEI for archiving) or make it available for downloading. For example, you could run ArchiveADataset every day a 12:10 am and have it make a .zip of all the data from 12:00 am the previous day until 12:00 am today. (Or, do this weekly, monthly, or yearly, as needed.) Because the packaged file is generated offline, there is no danger of a timeout or too much data, as there would be for a standard ERDDAP request. is an alternative good solution when data is added to a dataset frequently, but older data is never changed. Basically, anyone can use standard requests to get data for a specific range of time. For example, at 12:10 am everyday, you could make a request for all of the data from a remote dataset from 12:00 am the previous day until 12:00 am today. The limitation (compared to the ArchiveADataset approach) is the risk of a timeout or there being too much data for a single file. You can avoid the limitation by making more frequent requests for smaller time periods. The new EDDTableFromHttpGet dataset type in ERDDAP v2.0 makes it possible to envision another solution. The underlying files maintained by this type of dataset are essentially log files that record changes to the dataset. It should be possible to build a system that maintains a local dataset by periodically (or based on a trigger) requests all the changes that have been made to the remote dataset since that last request. That should be as efficient (or more) than rsync and would handle many difficult scenarios, but would only work if the remote and local datasets are EDDTableFromHttpGet datasets. If anyone wants to work on this, please contact bob.simons at noaa.gov . None of the solutions above does a great job of solving the hard variations of the problem because replication of near real time (NRT) datasets is very hard, partly because of all the possible scenarios. There is a great solution: don't even try to replicate the data. Instead, use the one authoritative source (one dataset on one ERDDAP), maintained by the data provider (e.g., a regional office). All users who want data from that dataset always get it from the source. For example, browser-based apps get the data from a URL-based request, so it shouldn't matter that the request is to the original source on a remote server (not the same server that is hosting the ESM). A lot of people have been advocating this Distributed Data approach for a long time (e.g., Roy Mendelssohn for the last 20+ years). ERDDAP's grid/federation model (the top 80% of this document) is based on this approach. This solution is like a sword to a Gordian Knot — the entire problem goes away. This solution is stunningly simple. This solution is stunningly efficient since no work is done to keep a replicated dataset(s) up-to-date. Users can get the latest data at any time (e.g., with a latency of only ~0.5 second). No, this isn't a solution for all possible situations, but it is a great solution for the vast majority. If there are problems/weaknesses with this solution in certain situations, it is often worth working to solve those problems or living with those weaknesses because of the stunning advantages of this solution. If/when this solution is really unacceptable for a given situation, e.g., when you really must have a local copy of the data, then consider the other solutions discussed above. While there is no single, simple solution which perfectly solves all the problem in all scenarios (as rsync and Distributed Data almost are), hopefully there are sufficient tools and options so that you can find an acceptable solution for your particular situation. Questions, comments, suggestions? Please send an email to bob dot simons at noaa dot gov and include the ERDDAP URL directly related to your question or comment.